Shoebox Legends: My Very Own Dit! 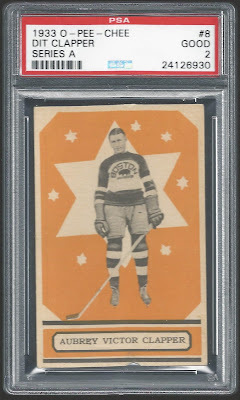 Just one card to share with you this evening, but it's a pretty significant one from my hockey card collection. It's also a shining example of just how long I sit on really interesting cards sometimes before I get around to posting them here, as I purchased it all the way back in June...of 2015! 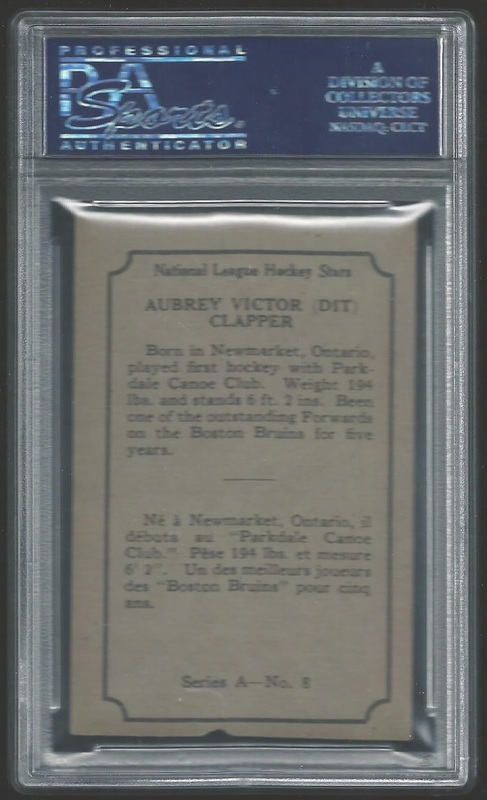 From the inaugural O-Pee-Chee hockey set issued in 1933, I give you Aubrey "Dit" Clapper! Dit began his career with the Bruins in 1927, and helped the team win their very first Stanley Cup Championship within just a couple of seasons. 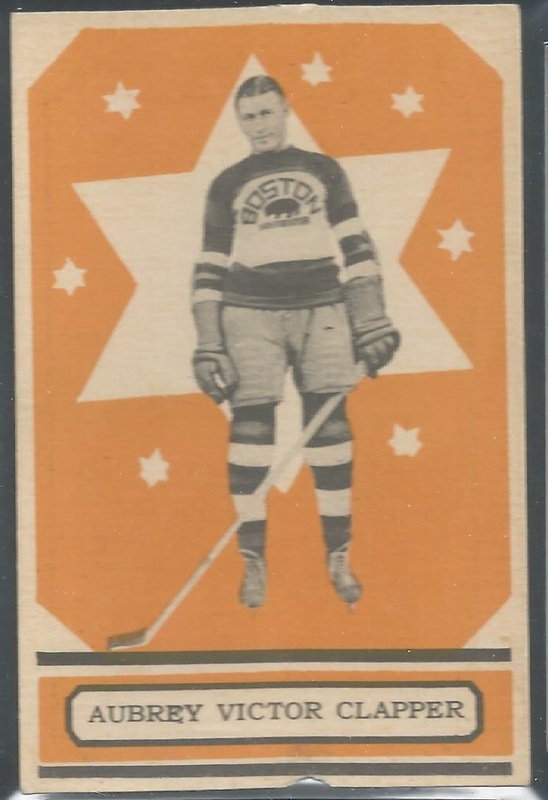 While he began as a high-scoring winger, he had transitioned to defense by the end of the 1930s, and paired with some guy named Eddie Shore helped deliver a couple more Stanley Cups to the city of Boston. Dit played an amazing 20 seasons in the NHL, all of them with the Bruins, and was inducted into the Hockey Hall of Fame immediately upon his retirement. He would coach the team for a few seasons as well, first as a player-coach (still the only one in team history), then continuing after he hung up his skates for the final time. Here's a look at the back, pardon the scanner glare. If you'd like to read the write-up you should get a larger image if you click the photograph. Not the most exciting card back in history, but this was 1933, what do you expect? Here's a closer view of the front. An awesome look at an early '30s Bruins sweater here, featuring a logo that fans have seen on some third jerseys in recent decades. While the design for this set is fairly simplistic, it's nonetheless a significant release given that O-Pee-Chee went on to become the standard-bearer for hockey card sets for decades to come. 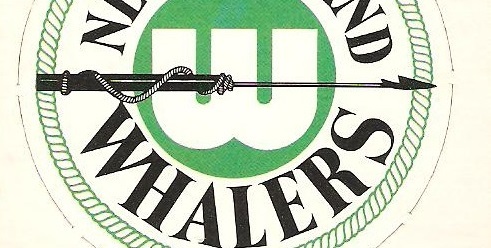 There's a small notch in the card along the very bottom, but I don't think it impacts the overall visual appeal much. Besides, it's probably the only reason a card like this was affordable to a collector like me. This is my only authentic Clapper card from his playing days. Given the limited number of releases during this era, and the price tag on many of those cards if and when you ever see them, it will probably always be my only one. Fine with me though, in my eyes this card is a true gem and I'm honored to own a copy. 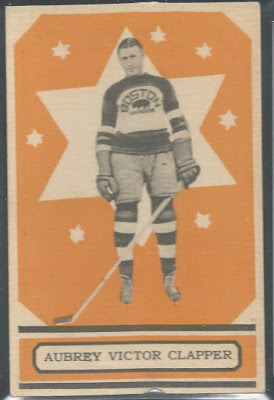 If you happen to be a hockey card collector I'd love to hear what your oldest card is in the comments. Thanks for stopping by as always! Wow! That is truly an amazing card. Simply gorgeous. Clapper was the first player ever to enter the HOF immediately upon retirement. Great card! I can understand why you treasure it. Funny coincidence. At lunch today I was reading Gretzky's chapter on the early Bruins and their advantage on the smaller Boston Garden ice. Shane that is a beauty. What an awesome piece of history. I'm not 100% sure... but I think my oldest hockey card is a 1968-69 O-Pee-Chee Gordie Howe. 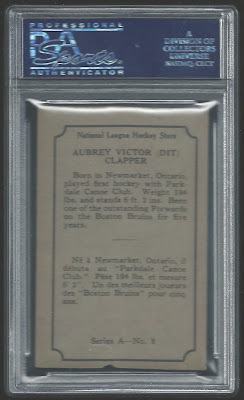 Sweet Clapper card! Man that was quite a find! If that's a PSA 2 it's the nicest 2 I've seen on any card anywhere. The small notch out of the bottom doesn't detract nearly as much as a heavy crease or poor centering would. You've got a real gem there! 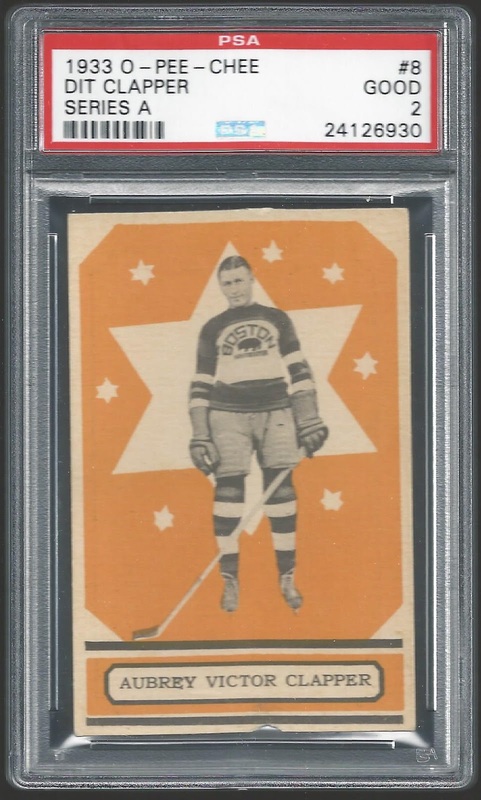 My oldest cards are a pair of 1933 Goudey baseball that I picked up in two different COMC purchases, but I dont go back all that far in hockey. My neighbor gave me a few loose singles from the early 70's Topps sets when he moved out of town - Walt Tkazuk, Terry Harper, and an airbrushed Pete Stemkowski. They all have a small pen mark on them. Just checked my album and the Harper and Stemkowski are from 70-71 Topps, so those are my oldest. The Tkazuk is a 71-72 Topps. Really nice, congrats! My oldest hockey is 1969-70 but my local vintage dealer has some from the mid 1960s at $3 so it might change someday. My oldest overall is 1905 but I have something older coming from COMC. My oldest card (cards) comes from the iconic 1951/52 Parkhurst set. A few years ago I decided that I would begin tackling that set. I realize that it will likely take me my lifetime to complete as there are some very pricey rookies in it. But going with your approach of finding the right card in the right condition will surely make it an attainable goal. I just acquired my 16th and 17th cards (of 105) at the most recent card show here. That's a great card! I've never seen one of those before, and I didn't even realize that O-Pee-Chee hockey cards went back that far. My oldest hockey card is a 1954-55 Topps Hockey card that I love, but that one is very much an outlier - the rest of my hockey collection goes from 1968 forward. Dit Clapper sounds like either the worst or funniest STD you could pick up. Gorgeous card! Nothing old in my hockey collection, not that surprising considering my team didn't exist until 1993. One day I'll nab something old and cool.